PavilionLake, in British Columbia, Canada, is home to a biological mystery.Microbialites, coral-like structures built by bacteria, in a variety of sizesand shapes, carpet the lakebed. That?s unusual for a freshwater lake likePavilion. So unusual that researchers don?t know of any other freshwater lakein the world that has microbialites with some of the same strange shapes. Thatexplains why scientists have established the Pavilion Lake Research Project(PLRP) to study the lake. They want to understand what?s so unusual aboutseemingly normal Pavilion Lake, how the microbial structures manageto survive, why they aren?t destroyed by snails, worms and other grazinganimals, as they are elsewhere. What itdoesn?t explain is why NASA?s MMAMA (Moon and Mars Analogue MissionsActivities) program has funded the PRLP to continue its work for the nextseveral years. Or why astronauts from NASA and CSA (the Canadian Space Agency)are participating in the project. After all, there are no lakes on the moon,and it?s been a long time since there were any on Mars. Because ofthe logistical difficulty of doing comprehensive exploration in an underwaterenvironment, however, lessons learned in the process of exploring Pavilion Lakeare directly relevant to future human explorationof other worlds. ?We?redoing science in a setting where we have limited life support,? says DarleneLim of NASA Ames Research Center, PLRP?s principal investigator. ?I can?t justwalk out and hang out with [an interesting] rock all day.? PLRP divershave been studying the lake for several years, but were able to survey only asmall fraction of it. So in 2008, researchers began exploring in the lake inDeepWorkers, mini-submersibles just large enough for a pilot to squeeze inside.That?s when NASA and CSA sent astronauts to the scene. A second round ofDeepWorker exploration took place in 2009. Whileconducting scientific research, Lim and the other DeepWorker pilots mustconstantly monitor their oxygen supply and battery power, and check to makesure no system faults are occurring. In this way, their experience resemblesthe challenges astronauts will face exploringthe surface of another world. Ofparticular interest to NASA and the CSA are questions about how researchers canmaximize their scientific return, given the limited amount of time pilots canspend in the DeepWorkers. That has meant teaching pilots ? including astronautswith limited scientific field experience ? how to perform good scientificobservations while contending with the stress of operating underwater. ?We wantedto make sure that we discussed how to balance being execution-minded anddiscovery-minded,? Lim explained. ?Execution-mindedness is where you?re verygood at following a sequence of steps. That?s great,? she conceded, but ?youmight [fly right] by something that was incredibly important.? Knowing when tostop, when to interrupt the plan, when to turn around and go back for a secondlook, is a skill that is best learned and honed in a real field sciencesetting. It would be ?a real shame to send somebody all the way to Mars andhave them miss the alien, right?? To thatend, PLRP experimented with both new technology and new procedures during the2009 field season. 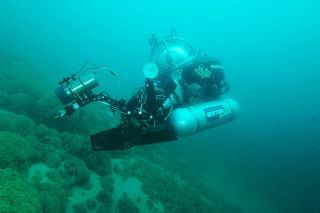 Forexample, pilots both last year and this year captured continuous steams ofvideo during theirunderwater flights. But this year the video was captured to hard disk,rather than to tape. Thattechnological leap, in turn, made possible a procedural leap. Each night theentire team was able to review the day?s work, by discussing the science data,evaluating pilots? activity and suggesting improvements, which could beimplemented literally overnight. ?Within a flight ? not three flights, butwithin a flight ? we saw dramatic improvement in everybody?s capabilities aspilots and as observational scientists,? said Lim. ?Itreminded me of a ballet class where the teacher shows you how to do something,then you?re supposed to do it. And then they?ll come around and correct you.But the rest of the time, you?re kind of watching each other in the mirror. Andthat?s exactly what this was. It was an opportunity to watch each other in themirror. And watch yourself in the mirror. And adjust.? PLRP thisyear also worked with software engineers from the Intelligent Robotics Group(IRG) at NASA Ames to generate data-rich maps of the lake, updated in realtime. IRG engineers onboard ?chase? boats on the surface followed the subs asthey explored underwater, populating their map with points of interest,represented by icons. Clicking an icon opened a window that contained video orfield notes associated with a particular spot in the lake. Research atPavilion Lake will continue with one more field season in the summer of 2010.After that, PLRP will most likely move on to explore other lakes. ?The realtest? of ?all those protocols,? Lim said, is ?if you can take them somewhereelse and they work? there, too.